hang on, let me back up. I'm currently sitting at my computer in the living room while my kiddos eat their lunches and there are probably twenty things I could be doing right now other than this. Five of those things are probably more "important" than this blog post but I've got something to share. But I only have time to write it, not edit it etc. so this is gonna be quick and unedited (sorry mom). So, on my Instagram the other day I wrote about this gap between draft and edit. I sat across the table from my friend today. She is one of several sweet friends I have met at the library. We sat at Chick-fil-a while my kids played on the other side of the glass in the play area and I asked her "what did you do right with your homeschooling?" her kids are older than mine and I just really really needed a dose of perspective. "What did I do wrong?" she asked. "No." I said quickly, "I think the jury is still out on that, but what do you feel, as you look back, that you are glad you did. What did you get right?" Her reply was exactly what I needed to hear: she said that she was glad that she trusted herself. She can tell me her story from the end of that chapter, I'm still in the middle. And if there is one thing I have learned about these middle spaces it is that they are messy. And this brings me back around to the gap between the draft and the edit. Our day by day is like a draft. It is messy and imperfect and in-process. When we get to the end of that season and we get to tell the story of how it all went we get to tell the edited version. It's appropriate that we do this. The problem comes in when we judge our messy first-drafts to other people's edited stories. I'm sure my friend had lots of totally crap days. She might not have called them that, but that's what I'd call them. Days when I wonder "what did I even accomplish today?" and "does this even matter?" But at the red light, I turned and smiled at my baby and he smiled back at me - his whole face glowing with the smile of someone who is fully loved. That's it. One little piece of it, but important. One good line in the draft of this day. One that may or may not make it past the first round of edits. He might not even remember being three. But he'll know what it was to be small and to be loved and that will matter. Well, the boys are drawing on the wall now so I guess I'm done. I started writing this our first week back to school when the sun had come out, the skies were blue, and we were mostly back to our routine - it was lovely. But the sky turned gray again, I got a bit overwhelmed with some kid-related stuff and didn't get a chance to finish this post. So I'm going to file this (along with many many other things recently) under "better late than never". During the break, I had some time to look back over what I shared on Instagram and one of the things that brought me a lot of joy was sharing what I was reading. I shared more in my stories then I did in my posts but I shared at least one book every month. It is a habit I'm sure I'll be continuing. I heard that this book was in tons of top 10 lists for 2018. It was Amazon's #1 book of the year - and for good reason. This wasn't just an over-hyped mega-seller, this was a really good book. I have heard that some people really loved it because it was a true story. I loved it because it was well-written, the pace was good, the tone is amazing. It's about Tara's life growing up with her religious fundamentalist extremist parents. Her education at home was completely neglected, she was used as child labor, she was abused by her brother and yet she treats this whole story with love and grace. She doesn't rant against a system or, for the most part, a person. She isn't trying to push for any kind of reform or legislation. She is just sharing her story. You can tell she has done a lot of work to forgive her family. In my opinion, it falls apart towards the end, and I felt a bit of bitterness creep in about some things that happened towards the end of the story. But overall I enjoyed this book a lot and it was one of the few that I finished. I call this genre "horror memoir" and it seemed to be really popular this year. In this genre, the story starts with a strange but true childhood and usually ends with something in the neighborhood of happily ever after. I started reading a few and this one was my favorite. This book has been compared to Glass Castle which was recently made into a movie (which I loved and is now available on Amazon Prime) I also felt a lot of the same themes were in the novel The Great Alone by Kristin Hannah. If you liked this book you may enjoy the memoir All The Pretty Things by Edie Wadsworth which was written from a Christian perspective. I received this as a Christmas present at the end of 2017 and it was my first book of 2018. It felt very much an "of the moment" kind of book - referenced a lot of hot topics, like the NRA and such. Not quite as much of a game-changer for me personally as "Rising Strong" but still very good. In her books, I see my biggest weaknesses and greatest strengths at the same time, and that is no small thing. I really want to read her next book Dare to Lead. If you have not read anything by Brene Brown I highly recommend that you just start, somewhere anywhere. 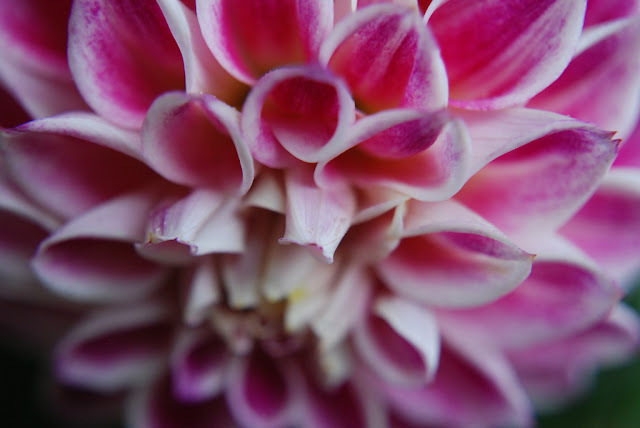 My favorite is Rising Strong, others prefer to start with The Gifts of Imperfection. I read this little book in one long nap time and I enjoyed it so very much. It is the story of Ruth Reichl's mother and grandmother as an example of the bored, stifled, educated women. I felt like I could relate to so much of what these women felt. The bored housewife has become a cliche for a reason - and this book demystified it for me and put words to some vague feelings I have had over the years. It's been re-published as "For You, Mom, Finally". I started reading a couple of other books in the short-memoir genre this year and this one was my favorite. I loved the feel of the whole thing. It's like a long, non-linear conversation with a dear middle-aged friend. You chat about writing, and listen to what it has been like for her to be a writer married to a writer with all of the ups and downs, successes, flops and the hope in between. This book is a peek into her home life and the light and shadow of happiness and sorrow, fear and bravery, strength and frailty of it all. If you liked "This is the story of a happy marriage" by Ann Patchett I think you'll love this one too. This is one of my favorite books of this year. Of all of the books I'll be recommending on into the next ten years this is one of them. She writes about life and loss and the things she's been learning along the way using phrases that she has picked up like "tell me more" or "I don't know" "I was wrong" and also the power of not saying anything at all. She shares about her father's and her dear friend's illness and death and what she learned about love through that whole long season of grief. The essays are short and honest and I really really loved nearly every one of them. I read some of this and it has been very good at helping me understand some of the why behind my kid's behavior. I feel like I've opened a new doorway into understanding my kids - and there is so much more for me to learn. Daniel Siegel has also written "No Drama Discipline" "Brainstorm" about the teenage brain and "The Yes Brain" just to name a few. I wrote in my Instagram review of this book that it seems like my generation struggles a lot with questions of faith and that the response to these questions tends to lean either in the direction of certainty or in the direction of doubt - sometimes to an extreme on both ends. This story of deconstruction and reconstruction is just beautiful. I loved the way that it is written with artistry and compassion and self-revelation. I didn't feel preached at. I didn't feel like I was being sold something, an idea even. But I did feel more of the deep corners of my own story of doubt and deconstruction and loss and fear. I felt so very much a part of the growing gathering in the wilderness and it is beautiful. Her story was shared in a super clickbaity way by BuzzFeed that misrepresented her story and created some (unhelpful) controversial buzz around her book. I think whichever way you personally respond to your questions - either with certainty or with doubt - you'll find a helpful story in this memoir. This book changed my life. In the way that the change of a quarter inch of trajectory eventually lands you in a completely different place. She's speaking right there into the space of the importance of small and ordinary and I loved it. Now I need to read the book she wrote before this one Falling Free. I won this in a giveaway on Instagram and I am so glad that I did! This is the first book I've read by Bob Goff and, to be honest, there were moments when I struggled with the extreme difference in personality between Bob Goff and myself (I was feeling pretty annoyed). But, overall I loved it. There were so many good chapters that I feel like I will re-read pretty soon. I've been following Annie for awhile now, and I was on the launch team for her book "Looking for Lovely" so I was pretty much going to read whatever Annie decided to write. This one was so good. I am thinking about re-reading it again already, it touched some deep and tender places in my heart. I still am not sure what I think about it and it has been a couple of months since I read it. This is what I'll say about it though - it is really honest in a way that we need in more of our Christians Women's Non-Fiction. Do yourself a favor - buy a copy and find out for yourself. This one may end up in my favorites of 2019 too since I am in the middle of it, but I'm going ahead and including it in this list too since it has been just so good. We all need to honestly examine what we really believe and what we just say we believe but really don't. This book has been really helpful to me and I will for sure be recommending it this year. This is one of my favorite novels of 2018 - it's about a woman who cancels her wedding on the day-of, after a conversation with an odd old lady - who ends up gifting her with her house! A house that no one has lived in for years and years, so obviously there's a mystery. If you like the fiction I tend to recommend, on the light and innocent side, you are going to love this one. I read it towards the beginning of 2018 and I was telling anyone who was asking for fiction recommendations to get this one. I loved the Narnia references, and while I'm typically not a fan of the multiple storylines style of novel I felt like it really worked in this one. The best friend/crush scenario worked really well for me as well, it is romantic and sentimental and right in my sweet spot. There is another novel by this author with the same cast of characters called Love Walked In I checked it out of the library three times and just could not get into it, however some of my friends liked it even better than I'll Be Your Blue Sky. It's about a young woman who escapes a fiasco in the city by taking a job baking at a small inn in Vermont. I was not too sure I was going to like this novel at first, but I had some time and so I gave it a chance. I'm glad I did because I really enjoyed it. It was, for the most part, a light, romantic read. I enjoyed the baking aspect and the building relationships between the main character and some of the supporting characters. If you enjoyed this book you might like The Patron Saint of Liars there are some similar themes (baking!) and the vibe felt similar to me. There is a follow-up book in the same small town in Vermont called The Late Bloomers Club. I share my thoughts about it farther down. Another book about a young woman escaping a life that she doesn't really want and finding a life that she does, this time in the wild and windy Upper Peninsula of Michigan. While I wouldn't say that this was my favorite novel of the year, it was definitely a light, quick, enjoyable read. I had seen a good bit on Bookstagram about this, so I requested it from the library and once I started reading it was totally hooked. It's a YA novel about a girl in a fundamentalist church who is trying to escape her family and her abusive brother. The only problem is that her family has been the subject of one of the longest running reality TV series of all time. It is suspenseful, heartbreaking, and in the end, redeeming. I read it really quickly. You can blame Netflix. You can blame my teenage daughter. You can blame Bookstagram friends. But really you'll have to blame my inner 13-year old for loving this series as much as I did. I wrote a review over on my woefully neglected fiction page. At the beginning of the year, I read Ready Player One and also Armada by Ernest Cline. Daniel and I saw the movie in the theater and really enjoyed it. If you liked the movie you'll probably enjoy reading this book too since pretty much every single plot point was different between the two. It was a bit adolescent male but I enjoyed it for what it was. I read the new-release The Late Bloomers Club by Louise Miller (author of City Baker's Guide to Country Living) and I enjoyed it but I felt like it was not as good as the former book and it did not take advantage of the world and characters that were built and established in the first novel. Overall, underwhelming and yet, also enjoyable. A Man Called Ove - So this one has got more adult language and triggering topics than I usually read but the style got me. No wonder this series is such a phenomenon. What I read I thoroughly enjoyed. I checked the movie out of the library to see how it ended. I have to preface this by saying that I still consider "The Poisonwood Bible" to be my favorite novel of all time. I checked out Unsheltered from the library but didn't get through it in the week I had it and so I didn't finish it. I found most of the characters only mildly likable and I struggled to see where this whole thing was going and got muddled a bit with the multiple plots in multiple time periods. Overall, I enjoyed what I read but I realized that I like to read novels that I can get through quickly and this was not one of them. I read this during the winter in early 2019, mostly in the bathtub. It was lovely. But the pace is so slow. Another testament to the truth that I like to read short, fast-paced novels at the moment. One day I will have more time to read and one day I will luxuriate in novels like this one. It's about a girl, her mom and her dad who is suffering from PTSD and who decides to move them out to the wilderness of Alaska. While I read non-fiction every year, some years are lighter than others. Looking back over this list I am happy with the number of non-fiction books I read. It shows me that I had more mental capacity this year than last! 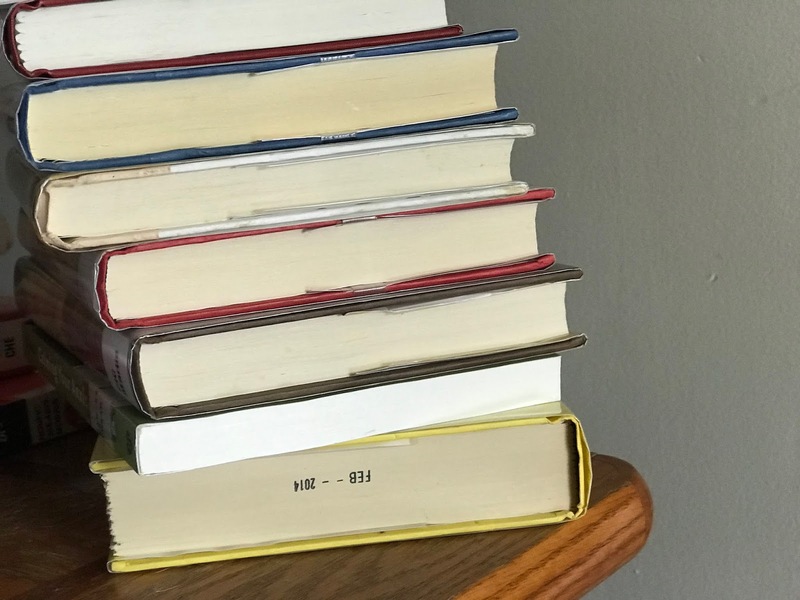 At the beginning of 2017, when I decided to start reviewing books on my blog and posting more intentionally about what I was reading on social media, I quickly realized that I was going to have to narrow my genre. I simply could not read and review every book that interested me in every genre. So I limited my review requests to primarily Christian Women's non-fiction (non-fiction books about Christian faith/spirituality written by women. Often listed as Christian Living/Women's Issues). I read and reviewed a lot of Christian Women's non-fiction and helped with several book launches in 2017 which was wonderful. I got to see behind the scenes of the book publishing industry a little bit more. I began some relationships both with authors and with book reviewers that I hope will continue. In 2018 I only helped launch a couple of books and it was a nice change of pace. It was an intentional choice as I was getting ready to launch my own book, I also got to read more of what I wanted to read and felt a little bit less pressure to read only what was just coming out. In 2019 I plan to read fewer new releases and more of the titles I've been meaning to read and haven't gotten to yet. There are so many new releases coming out all of the time it is hard to keep up with it! I also want to re-read some favorites. When you are constantly trying to read all of the newest titles there is a lot of urgency, and therefore anxiety, around reading and that is not how I want to feel about reading, so yay for not keeping up! One of the things I noticed, as I compared what I read to what some of the people I follow read, is that they were much more intentional about seeking out more diverse authors. One of the benefits of reading is that we get to see the world through someone else's eyes and so making an effort to widen the circle of authors we're reading is super-valuable. I'm also wanting to be more intentional about reading more widely as far as depth, style, and genre - especially more poetry this year. I really do enjoy blogging a lot, even if it is tricky to find the right kind of time to get these written. I want to blog more book reviews and try to keep up with my read-watch-listen posts. I've started keeping better notes in my bullet journal so I'm hoping that helps! This year I want to do a better job of recording what I read - what I abandoned, what was okay, what I loved! I'm using the Goodreads app on my phone and so far that has helped. I'm also jotting things down in my bullet journal as I go. I wrote my first book this year. I'm proud of the fact that I did that, that I put myself out there in that way and shared my story the way that I did. But I know that my writing could be a lot stronger. I didn't read any books specifically about writing this year because while I was in the middle of writing my weird brand of perfectionism was raging. Well, that's all for now folks! If you have any questions about any of the titles or want to chat about a book we both read please do not hesitate to send me an email or a direct message on social media. Thank you for reading my blog posts. The purpose of the links in this post is so that you can easily see the product I'm referencing. Some of the links as affiliate links. If you make a purchase using this link I make a small commission and you pay the same price. 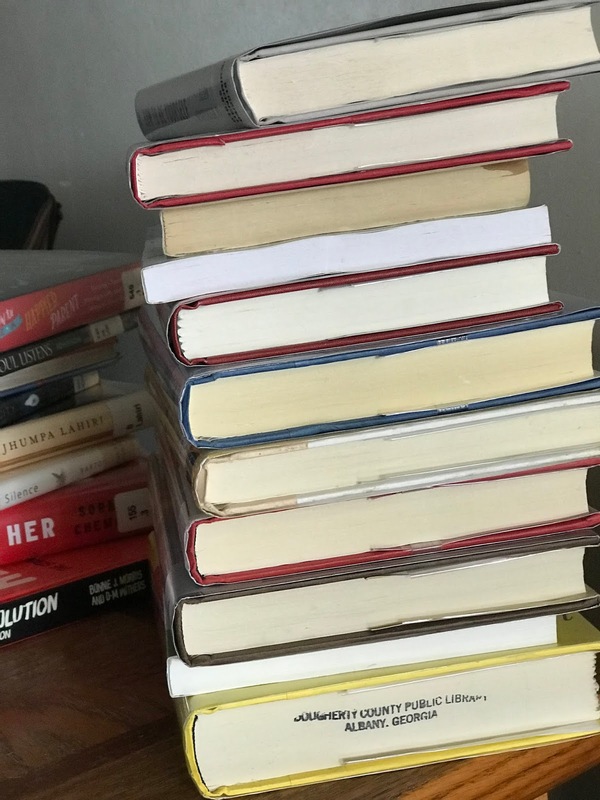 I hope that this post inspires you to read more - even if you are requesting your books from the library!